With all that bad press behind them why hasn’t someone come up with a better way to access a basement? The fact is that each home is different and each situation unique so there is never a one size fits all solution. We’re tackling this dilemma and going over your options for a basement access solution that is right for you and your home. If you’re replacing an existing bulkhead and looking for more attractive options you can start with the basics. An upgrade from a standard primed steel bulkhead is the powder coated variety. They’re still pretty standard so the price isn’t going to jump too much but the factory finish means it will likely last much longer. Powder coating is a type of coating that is applied as a free-flowing, dry powder, typically applied electrostatically and is then cured under heat to allow it to flow and form a “skin” over the metal. The result is a superior finish that is more durable and tougher than conventional paint. Powder coated finishes are typically more resistant to chipping, scratching and fading but are only available in a short list of colors. Typically white, sandstone or beige, some variation of grey and a brick color. So if you’re looking to match your custom painted exterior this may not be for you. What is Polyethylene you ask? In short, it’s plastic. Plastic has gotten a bad reputation these days because it doesn’t break down and can remain in a landfill for hundreds if not thousands of years. Bad – if it’s on a disposable product like a water bottle, but a very good thing if it is used on products that call for longevity. Bilco, one of the most widely used manufacturers of bulkheads has a polyethylene bulkhead that boasts little to no maintenance and a standard design that mimics the look of a wood door which is inherently more attractive. 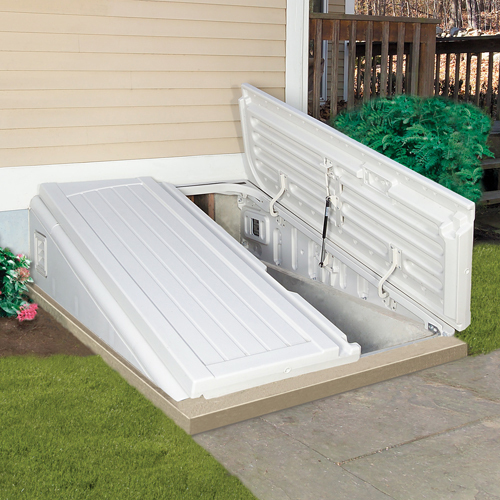 The door has a weather tight head gasket and the ability to change out side panels for venting or allowing natural light into your basement entry. It can withstand a 200 lb load capacity and has “motion dampers” that assist in a softer door closure. A 5 year manufacturer’s warranty is also available. One of the downfalls is color options are limited to the stock “driftwood” color as the door cannot be painted a custom color. 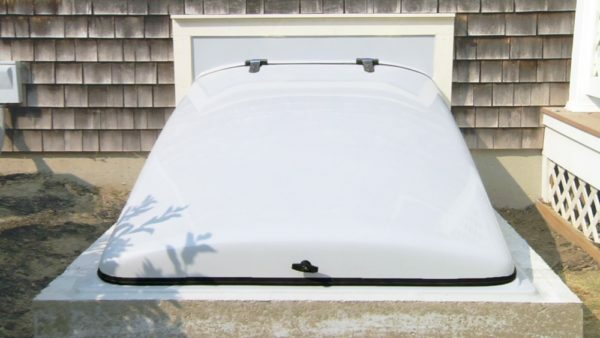 Another newer player on the bulkhead market is the fiberglass “Clam door” Emerging on the scene about 10 years ago, the Clam Door Company has taken their inspiration from nature (namely the clam) and their weatherproofing from the marine & sailing industry. 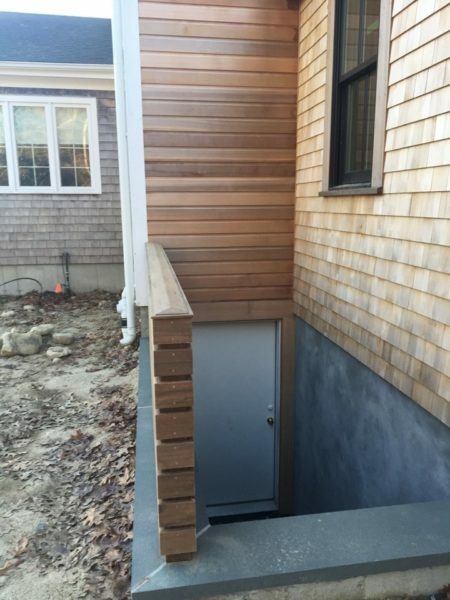 Made in Rhode Island and employing a full watertight gasket on the entire perimeter, this one piece door does seem to have the weather proofing and pest deterrent properties that other bulkhead doors don’t. If you own or have ever been on a boat this door may remind you more of a boat hatch than a bulkhead. The Fiberglass material comes in standard colors or can be customized for an additional cost. The Fiberglass materials also boasts it’s strength with a 700lb capacity in the center of the door and a hydraulic lift bar holds the door in an open position while in use. The price point is a bit higher than a standard bulkhead but the weatherproofing benefits and streamlined design may make that extra cost worth it for most homeowners. If even the nicest bulkhead just isn’t nice enough for your taste some opt to cover them up. 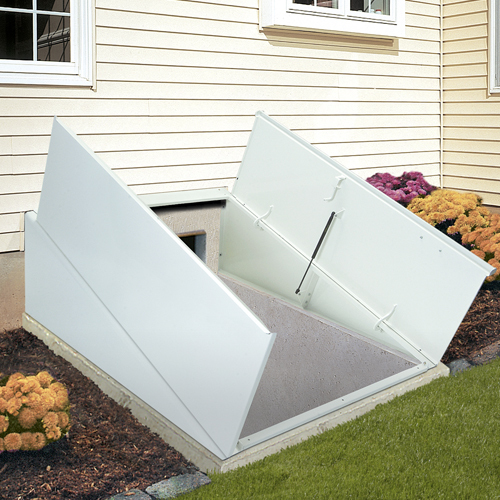 Custom options are available to integrate a Bulkhead “hatch” into a deck or patio. This creates a trap door of sorts that will be sure to impress your friends but may put a bit more stress on your wallet. The one pictured here is integrated into a deck so when closed just appears to blend in with the decking and in many cases would not even be noticeable to someone who didn’t know it was there. Like anything else, when you begin to get into a fully custom option such as this the cost inevitably rises so be prepared for the price tag that comes along with it. In some cases it may be possible to eliminate the bulkhead altogether. 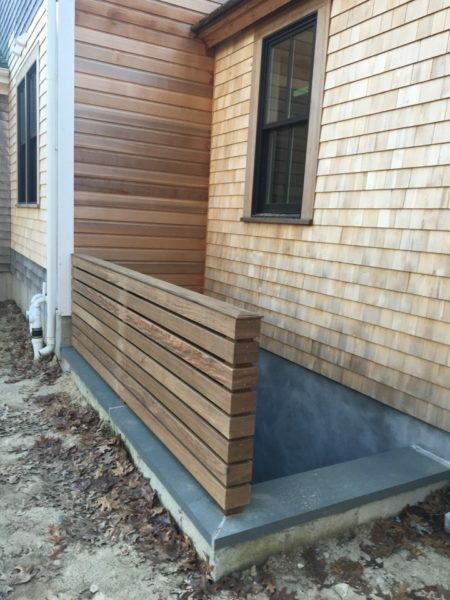 If you are building new or adding on an addition and want to plan ahead to eliminate the bulkhead and create an open stairwell there are a few things to consider. Protection from the elements is one of the major things you’ll have to plan ahead for. Without the protection of the bulkhead water can now get down into the stairwell. 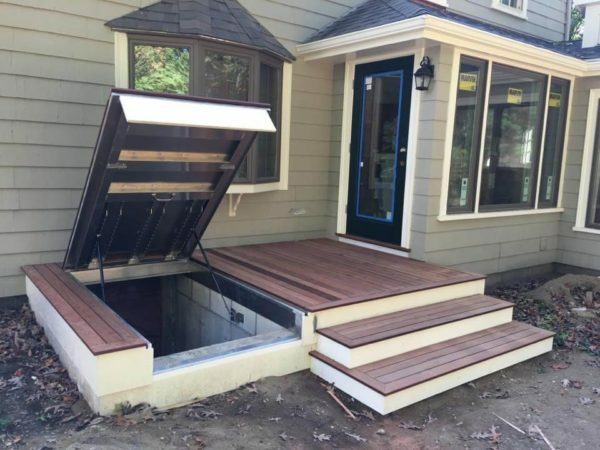 You will have to install a weather tight door at the entry point in to the basement foundation and ensure proper drainage at the base to prevent water & ice buildup. With an open stairwell you will also have to construct railings to prevent falls. The open stairwell pictured above from one of our Brewer Master Suite addition project called for capping the foundation walls with slate to create a more finished look and constructing the stairs and rail from mahogany. This basement access was definitely a step up from your typical bulkhead. Perhaps the most luxurious of all basement entries and a real departure from a standard bulkhead is the walk-out. Ultimately a walkout basement is one that has a point of entry/exit, direct from the foundation wall to the exterior grade. A portion of the basement is typically excavated out or resides on a slope leaving the majority of the basement walls exposed and above ground. Some walk-out basements also have windows allowing for added natural light in the lower level of a home. If you don’t already have a walk out basement it may be possible to create one but you’ll definitely need to enlist the help of the professionals. This example from one of our Highland Whole House Remodel uses a combination of elevation changes and custom retaining walls and stairwells to create a walkout basement that did not formerly exist. 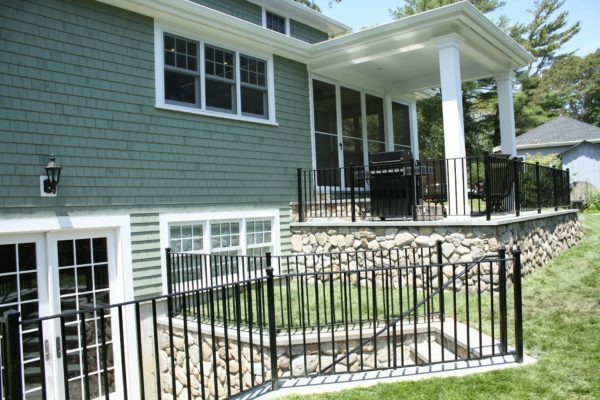 Metal railings were custom fabricated along with custom stone veneer and installation of a double french door to allow for added natural light in the basement. Clearly a more elaborate basement entry of this sort is in the highest price point of all that we have discussed but the effect and beauty may be well worth the cost for some homeowners.